Agricultural University of Cracow, Department of Refrigeration and Food Concentrates, ul. Balicka Kraków, Poland. Despite the fact that the nutritional value of fish is well known, it nevertheless plays only a limited role in the diet of many countries. Therefore, it would seem appropriate to find new processing methods for this valuable raw material so as to increase consumer interest. Compared to mammalian meat, fish meat has more water and less connective tissue, which contains very little elastin (Kolakowska and Kolakowski, 2001). Whereas in mammalian muscles the fibres are surrounded by endomysium, their bundles by perimysium and their muscles by epimysium, in fish the myomeres are longitudinally bound into segments called myotomes by means of the myocommata. This is clearly visible when fish meat is heated and separates into segments (gapping) (Sikorski, 1980; Mackie, 1994; Gawecki, 1997). Myofibrillar fraction accounts for 65-75% of the total protein in white muscle of fish. The myosin, found in white meat fish from temperate waters, is the least stable of all known myosins and therefore, easily affected by proteolytic enzymes. Fish actin, on the other hand, does not differ much from mammalian actin in its characteristics (Mackie, 1994). As for its nutritional value, fish protein contains all the exogenous amino acids in amounts exceeding the FAO/WHO standard of 1991 (FAO/WHO, 1991) and its digestibility is above 97% (Kolakowska and Kolakowski, 2001). However, during the sterilization of canned products at 115°C, the digestibility falls (Krauze et al., 1970; Gajewska and Lipka, 1978; Ganowiak and Lipka, 1979). This decrease in digestibility and the accompanying loss of available exogenous amino acids is caused by the formation of inter- and intramolecular crosslinking bonds within proteins. Moreover, the frequently observed loss of methionine and cysteine can be intensified by oxidative processes occurring in the presence of oxidized fats (Gawecki, 1997). With such delicately structured muscle tissue, fish is suited to low-temperature processing, from which such well-known products as salted and marinated herring are obtained, as well as the less popular Maatjes, Tidbits, Schnell-maaties and Surstromming (Knochel, 1993). However, species other than herring also provide good raw material for lowprocessed products. The initial quality of raw material is the most important problem for the quality of such products. Therefore, the product should be processed immediately after fish gaining. If it is impossible, proper chilling conditions ought to be assured to reduce the risk of bacteria growth and postmortem spoilage, which is associated with an increase of biogenic amines concentration (Özogul et al., 2002; Özogul et al., 2006). Among the more attractive delicatessen fish, low-processed products are gravads which are obtained by filleting such oily and medium oily fish as salmon, greenland halibut and trout, sprinkling the fillets with a mixture of salt, sugar and spices, and finally cold storing them for 1-4 days. After being removed from the resultant brine, the gravads may be consumed directly or vacuum packed and cold stored for several weeks (Knochel, 1993; Paarup et al., 1996; Lyhs et al., 2001). Although a great deal of attention has been paid to the issue of microbiological safety, especially with respect to Listeria monocytogenes (Loncarevic et al., 1996; Paarup et al., 1996; Lyhs et al., 2001; Lyhs et al., 2002; Michalczyk and Leszczynska-Fik, 2003), the available literature contains little information on the processes which take place during gravading. It gives no information on the possible roles played by enzymes and microorganisms in the process (Knochel, 1993). Similarly, little is known about the effect of the gravading process on the nutritional value of the product. Therefore, the aim of the present study was to determine how the process of gravading trout, which causes changes in fillet structure and the loss of water and nitrogenous substances to the resultant brine, affects the nutritional value of the protein in the product. Rainbow trout (Oncorhynchus mykiss), of average length 28-32 cm and weight 300 ±30 g, collected from a local fish farm, was used as raw material for analysis. Fish farmed in a pond at high stock density were fed on commercial, granulated feed mixtures. The fish were collected in winter, killed by a blow to the head, eviscerated and immediately chilled in ice. Within 4 hours the trout were filleted with the skin left on. The fillets were divided into three groups. The first was directed to the basic chemical composition and sulfur containing group’s analysis and then freeze dried (OE 950 Labor MIM, Hungary) as unprocessed, the second was boiled in steam for 10 min before freeze drying, and the rest was reserved for gravading. The gravading process involved sprinkling both sides of each fillet with a mixture of salt and sugar (1:2) at a rate of 350 g of mixture/kg of fillet, matching them in pairs meatside to meatside and placing in layers in enamelled containers under light pressure for 48 hours at 3°C (Michalczyk and Surówka, 2003). The gravads thus obtained were then removed from the brine, analysed for the basic chemical composition and sulfur containing groups and freeze-dried. After freeze-drying, the skin was removed from the dried samples, namely unprocessed, boiled and gravaded, and the muscle tissue was ground and passed through a 40 mesh sieve. The samples then underwent amino acids and in vivo nutritive value analysis. The basic chemical composition was determined according to Polish standards, namely protein by the Kjeldahl method (PN-75 A- 04018, 1976), water content by drying at 105ºC (PN-62 A-86783, 1988), fat content by the Soxhlet method (PN-67 A-86734, 1987) and ash at 550ºC (PN-ISO936, 2000). Sugar content was estimated using the phenol method described by Dubois et al. (1956), and chlorides by the Mohr method (PN-74 A-86739, 1975). The content of the available thiol groups (-SH), was determined using Ellman's reagent (5,5’–dithiobis (2 nitrobenzoic) acid) (DTNB) in accordance with the method described by Habeeb (1972). Disulfide bonds (-SS-) were analysed colorimetrically according to Chan and Wasserman (1993), after reaction with 2- nitro-5-thiosulfobenzoate (NTSB), which was synthetised using the method described by Thannhauser et al. (1987). The molar absorbancy index for –SH groups was assumed to be 13600 M-1 cm-1. Determination of the amino acid content was carried out by ion-exchange column chromatography using a T339M analyzer (Mikrotechna, Praha, Czech Republic) equipped with a column 5 mm in diameter and 35 cm in length. Acidic hydrolysis of proteins contained in the freeze dried samples was carried out using the Davies & Thomas method (1973). Hydrolysis for determining sulphur amino acids was conducted in accordance with Moore et al. (1958). Cysteine was oxidized to cysteic acid and methionine to methionine sulfone; then, after determining these derivatives, the results were recalculated to amino acids. Tryptophan was determined using the colorimetric method as described by Fik and Protasowicka (1983). On the basis of the results obtained and the FAO/WHO reference pattern (FAO/WHO, 1991), the chemical score (CS) and the exogenous amino acids integrated index (EAA) were calculated (Rakowska et al., 1978). Biological analyses of the nutritive value of the protein were performed on 6-week old male Wistar rats. Their body mass ranged from 95 to 115 grams. During the test, the animals were kept in individual metabolic cages at constant optimum temperature and air humidity. The adaptation period lasted 6 days and the remaining period was 5 days.The animals were weighed at the beginning of the study, after the adaptation period, and at the end of the test. They were fed a semi-synthetic AIN-93G diet (Reeves et al., 1993) containing 10% of the analysed protein and given to the animals at a daily dose of 10 gram. Access to water was unrestricted. The source of protein administered to the four groups of animals examined, consisting of six individuals each, was milk casein and freeze dried muscle tissue of raw, steam cooked and gravaded rainbow trout. During the test, the urine and faeces of the animals were collected, and at the end of test, their total nitrogen was determined by the Kjeldahl method, while metabolic and endogenous nitrogen were calculated using the Bock et al. formula, quoted in Eggum (1973). On the basis of the results obtained, true digestibility (TD) biological value (BV) and net protein utilization (NPU) were determined (Eggum, 1973). Analyses were performed in triplicate, with the exception of the in vivo experiments, which were conducted in 6 replications. The results were analysed statistically with the CSS Statistica package (Stat Soft, Tulsa, OK, USA). The significance of differences between means was determined using the one way Anova test at a confidence level of 5%. Sprinkling the trout fillets with the gravading mixture and storing them in a cold temperature causes brine to be released, with the partial diffusion of salt and sugar into the tissue. The effect on the basic chemical composition is given in Table 1, showing that the gravad contained a slightly higher proportion of protein and ash (NaCl) and sugar than those in raw fish. It also contained less water and fat than fresh trout. The content of proteinaceous substances (N x 6,25) in the discarded brine was 1.8 ± 0.16%. Earlier studies revealed that the ratio of gravading mixture to fish mass was more significant for the leaching of these substances into the brine than the proportion of salt in the mixture (Michalczyk and Surówka, 2003). Table 1: Basic chemical composition (%) of raw and gravaded rainbow trout meat. The partial dehydratation of muscle tissue during gravading was also the trigger for its structural changes, while the protein structure of the tissue had a manifold effect on the digestibility and nutritional value of the protein. In order to characterize the changes that protein undergoes in the gravading process, the number of available thiol groups and disulfide bonds were determined since changes in protein structure tend to be denaturative and occur in the presence of sulphur amino acid moieties (Opstvedt et al., 1984). Although Connell (1965) believed that the denaturative aggregation of fish protein during freezing is caused by hydrogen, hydrophobic and other bonds, with no contribution from disulfide bridge formation, it was Buttkus (1970, 1971) who suggested that the denaturation of trout proteins occurs as the effect of such formation. This was later proved by the studies of Jiang et al. (1988) and Surówka (1996). The energy of covalent disulfide bonds greatly exceeds that of ionic, hydrogen, hydrophobic, and van der Walls interactions, which is why they play an important role in protein structure formation even though they do not occur in large numbers. The content of sulfur-containing functional groups in the protein of raw fish and the gravad obtained from it are presented in Table 2. As a result of gravading, an increase in the number of the groups determined was observed. The same tendency was noted by Le Blanc and Le Blanc (1992), who examined cod during frozen storage. Moreover, studies carried out by Surówka (1996) on superchilled trout at a temperature of -2°C showed that, although this process initially caused a decrease in the concentration of sulfur-containing groups in the myofibrillar proteins, further storage resulted in their growth. This may suggest that in gravaded fish, as in the case of superchilled trout, partial unfolding of protein molecules takes place, resulting in an increased availability of the -SH groups. Some of these groups will obviously find favourable thermodynamic and steric conditions to form disulfide bonds, particularly in the increased redox potential environment. This may lead to a lowering of the biological value of gravad protein compared to the protein in raw trout since -SS- protein bonds make proteolytic enzyme activity difficult, which in turn lowers the digestibility of proteins, as reported by Opstvedt et al. (1984). The above thesis has been discussed in the present study in the context of the gravading process and its effect on the nutritional value of trout gravad protein. Table 2: The content of sulfur containing groups in raw and gravaded rainbow trout meat (mol/g protein). The in vitro investigation concerned the amino acid composition of proteins in the muscle tissue of raw trout and trout gravad as well as, steam cooked trout. The results are presented in Table 3. The amino acid content of raw trout muscle tissue did not differ significantly from that reported in the literature. However, it should be pointed out that there are considerable discrepancies in the values obtained by different authors for specific amino acids (Mai et al., 1980; Americo et al., 1996; Kunachowicz et al., 1998). Generally, the gravading process leads to an increase about 5% in total essential amino acid content compared to raw trout protein. An increase in tyrosine and phenylalanine content is accompanied by a decrease in tryptophan and methionine. In addition, there was a rise in total essential amino acids following steam cooking, although lower than in the case of gravading. These changes probably result from the leaching of some proteinaceous substances into the brine and cooked drip. On the basis of the results, CS and EAA values were computed. However, due to the fact that no limiting amino acid became apparent in the tests, and the content of all exogenous amino acids was higher than in the 1991 FAO/WHO reference pattern applied in the present investigation, these indices amounted to 100 for each of the analysed proteins. The results of the in vitro studies suggest that the protein in trout gravad is complete and the small loss of nitrogen passing into brine as a result of the gravading process does not significantly affect its nutritive value. Table 3: Amino acids content in raw, steam cooked and gravaded rainbow trout meat. The results of studies involving TD, BV and NPU with respect to raw trout, steam cooked trout and trout gravad are presented in Table 4. The control group in this study consisted of rats receiving a diet in which milk casein was the source of protein. The data obtained did not significantly differ from those given in the literature for certain species of fish (Astavan et al., 1994; Castrillón et al., 1996; Vishwanath et al., 1998). Generally, the nutrition index values obtained for all kinds of diets with the addition of trout were fairly high. Among the diets tested, that with the highest nutritive value was raw trout, second only to casein, which was regarded as the standard, while gravad proved to be the least nutritive. The differences between the gravad and steam cooked trout were found to be statistically insignificant. Moreover, the diet with the addition of gravad showed the highest values of standard deviations. The wide range of results in the case of this product may not so much due to the value of the fish protein as to the salt contained in the trout gravad. Although Astavan et al. (1994) did not find any significant effect of NaCl on the nutritive value of tuna using it as an 8-10% addition in diet, it is, however, difficult to find any other explanation for these observations. As a result of the gravading process, there was partial dehydratation of muscle tissue in raibow trout, accompanied by an increase in the proportion of protein in it and the leaching of some proteinaceous substances into the brine. This led to a modification of the protein structure, expressed by an increase in the content of available thiol groups and disulfide cross-links. Moreover, changes in some in vivo nutritive value indices occured, namely decreases in biological value (BV) and net protein utilization (NPU); however, true digestibility (TD) slightly increased although they are not statistically significant. In addition, the proportion of exogenous amino acids increased slightly in gravads; however, it did not have an effect on the chemical score (SC) and exogenous amino acids integrated index (EAA); as in the case of raw fish, the maximum values were obtained.Generally, the effects of the gravading process on the nutritive value of trout meat are similar to those of the steam cooking process. The authors would like to thank Prof. Pawel Pisulewski for his help in carrying out biological tests at the Department of Human Nutrition of the Agricultural University in Kraków. Americo, M., Ruggi, C., Badini, C., (1996). Meat quality of reared fish; nutritional aspects. Italian Journal of Food Science, 8 (3): 221-229. Astavan, M., Wahyuni, M., Yamada, K., Tadokoro, T., Maekawa. A., (1994). Effect of high salt content of Indonesian driedsalted fish on rats. Journal of Agricultural and Food Chemistry, 42 (10): 2265-2269. Buttkus, H., (1970). Accelerated denaturation of myosin in frozen solution. Journal of Food Science, 35 (5): 558-562. Buttkus, H., (1971). The sulfhydryl content of rabbit and trout myosin in relation to protein stability. Canadian Journal of Biochemistry, 49: 97-102. Castrillón, A.M., Navarro, M.P., Garcia-Arias, M.T., (1996). Tuna protein quality changes after canning. Journal of Food Science, 61 (6): 1250-1253. Chan, K., Wasserman, B.P., (1993). Direct colorimetric assay of free thiol groups and disulfide bonds in suspensions of solubilized and particulate cereal proteins. Cereal Chemistry, 70 (1): 22-26. Connell, J.J., (1965). The use of SDS in the study of protein interactions during the storage of cod flesh at -14°C. Journal of the Science of Food and Agriculture, 16: 769-772. Davies, M.G., Thomas, A.J., (1973). An investigation of hydrolytic techniques for the amino acid analysis of foodstuffs. Journal of the Science of Food and Agriculture, 24 (12): 1525-1540. Dubois, M., Gilles, K.A., Hamilton, J.K., Rebers, P.A., Smith, F., (1956). Colorimetric method for determination of sugars and related substances. Analytical Chemistry, 28 (3): 350-356. Eggum, B.O., (1973). A study of certain factors influencing protein utilization in rats and pigs. Trykt; Frederiksberg Bogtrykkeri, pp. 8-55. FAO/WHO, (1991). Protein quality evaluation. Report of the Joint FAO/WHO Expert Consultation; FAO Food and Nutrition, paper 51, FAO, Roma, Italy. Fik, M., Protasowicka, A., (1983). Feed processing – laboratory manuals. Akademia Rolnicza w Szczecinie, Szczecin. Gajewska, R., Lipka, E., (1978). 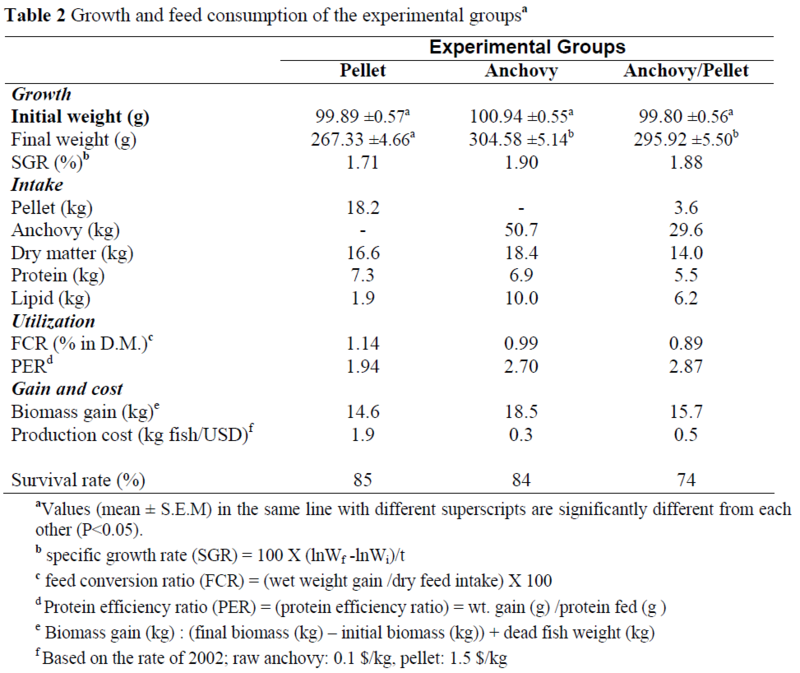 Analysis of raw and canned fish protein digestibility. Przemysl Spozywczy, 32 (8): 305-306. Ganowiak, Z., Lipka, E., (1979). Biological assays of nutritive value of raw and processed fish. Bromatologia i Chemia Toksykologiczna, 12 (2): 97-101. Gawecki, J. (Ed. ), (1997). Proteins in food and nutrition. Biblioteczka Olimpiady Wiedzy o Zywieniu, Wydawnictwo AR im. A Cieszkowskiego, Poznan. Habeeb, A.F.S.A., (1972). Reaction of protein sulfhydryl groups with Ellman’s reagent. In: Hivs, C.-H.W., Timashoff, S.N. (Eds. ), Methods in enzymology. pp. 457-464. Jiang, S.T., Hwang, D.C., Chen, C.S., (1988). Denaturation and change in SH group of actomyosin from milkfish (Chanos Chanos) during storage at -20°C. Journal of Agricultural and Food Chemistry, 36 (3): 433-437. Knochel, S., (1993). Fish fermentation technology. The United Nations University. pp. 53-70. Kolakowska, A., Kolakowski, E., (2001). Fish nutritive value. Przemysl Spozywczy, 55 (6): 10-13. Kunachowicz, H., Nadolna, I., Przygoda, B., Iwanow, K., (1998). The tables of nutritive value of foodstuffs. Instytut Zywnosci i Zywienia, Warszawa. Krauze, S., Oledzka, R., Buczynska, Z., (1970). In vitro enzymic digestibility of animal protein. Roczniki PZH, 21 (3): 287- 292. Le Blanc, E.L., Le Blanc, R.J., (1992). Determination of hydrophobicity and reactive groups in proteins of cod (Gadus morhua) muscle during frozen storage. Food Chemistry, 43 (1): 3-11. Loncarevic, S., Tham, W., Danielsson-Tham, M.L., (1996). Prevalence of Listeria monocytogenes and ather Listeria spp. in smoked and „gravad” fish. Acta Veterinaria Scandinavica, 37 (1): 13-18. Lyhs, U., Korkeala, H., Björkroth, J., (2002). Identification of lactic acid bacteria from spoiled vacuum-packaged „gravad” rainbow trout using ribotyping. International Journal of Food Microbiology, 72 (1-2): 147-153. Lyhs, U., Lahtinen, J., Fredriksson-Ahomaa, M., Hyytiä-Trees, E., Elfing, K., Korkeala, H., (2001). Microbiological quality and shelf-life of vacuum-packaged “gravad” rainbow trout stored at 3 and 8°C. International Journal of Food Microbiology, 70 (3): 221-230. Mackie, I., (1994). Fish protein. In: Hudson B.J.F. (Ed), New and developing sources of Food Proteins. Chapman Hall, London, N.York, Tokyo, Melbourne. pp. 95-143. Mai, J., Shetty, J.K., Kan, T.-M., Kinsella, J.E., (1980). Protein and amino acid composition of select freshwater fish. Journal of Agricultural and Food Chemistry, 28 (4): 884-885. Michalczyk, M., Leszczynska-Fik, A., (2003). Listeria monocytogenes in gravad rainbow trout (Oncorhynchus mykiss). Zywnosc, Supl., 35 (2): 122-128. Michalczyk, M., Surówka, K., (2003). Technology and consumer acceptability of gravad rainbow trout (Oncorhynchus mykiss). Zywnosc, Supl. 36 (3): 131-140. Moore, S., Spackman, D.H., Stein, W.H., (1958). Chromatography of amino acids on sulfonated polystyrene resins. Analytical Chemistry, 30: 1185-1190. Opstvedt, J., Miller, R., Hardy, R.W., Spinelli, J., (1984). Heat-induced changes in sulfhydryl groups and disulfide bonds in fish protein and their effect on protein and amino acid digestibility in rainbow trout (Salmo gairdneri). Journal of Agricultural and Food Chemistry, 32 (4): 929-935. Özogul, Y., Ahmad, J.I., Hole, M., Özogul, F., Deguara, S., (2006). The effects of partial replacement of fish meal by vegetable protein sources in the diet of rainbow trout (Onchorynchus mykiss) on post mortem spoilage of fillets. Food Chemistry, 96: 549-561. Paarup, T., Ruiz-Capillas, C., Morales, J., Lopez, E., Moral, A., (1996). „ Gravad” – type rainbow trout, packed in vacuum and modified atmosphere: microbiological, biochemical and sensory aspects. Refrigeration and aquaculture, in Bordeaux (France) colloquium, Proceedings IIR Conference-Commission C2. pp. 333-337. PN-75 A-04018, (1976). Polish Standard. Agricultural and food products. Nitrogen determination by Kjeldahl method. PN-74 A-86739, (1975). Polish Standard. Fish and fish products. Sodium chloride determination. PN-67 A-86734, (1987). Polish Standard. Fish, fish products and by-products of fish origin. Fat determination. PN-62 A-86783, (1988). Polish Standard. Fish and fish products. Water determination. PN-ISO936, (2000). Polish Standard. Meat and meat products. Total ash determination. Rakowska, M., Szkilladziowa, W., Kunachowicz, M., (1978). Biological value of food protein. Wydawnictwa Naukowo- Techniczne, Warszawa. Reeves, P.G., Nielsen, F.H., Fahey, G.C., (1993). AIN – 93 Purified diets for laboratory rodents. Final Report of the American Institute of Nutrition Ad Hoc Writing Committee on the Reformulation of the AIN-76A Rodent Diet. Journal of Nutrition, 123: 1939-1951. Sikorski, Z.E., (1980). Technology of seafoods. Wydawnictwa Naukowo- Techniczne, Warszawa. Surówka, K., (1996). Hydrophobicity and sulphur containing groups content in the meat of superchilled rainbow trout (Salmo gairdneri Rrich). Zeszyty Naukowe AR Krakowie (Technologia Zywnosci), 309 (8): 29-40. Thannhauser, T.W., Konishi, Y., Scheraga, H.A., (1987). Analysis for disulfide bonds in peptides and proteins. Methods of Enzymology, 143: 115-119. Vishwanath, W., Lilabati, H., Bijen, M., (1998). Biochemical, nutritional and microbiological quality of fresh and smoked mud eel fish Monopterus albus – a comparative study. Food Chemistry, 61 (1/2): 153-156.